With the presence of so many hair care products in the market, it becomes difficult to decide, which product is suitable for your hair. To deal with this dilemma, it is always best to choose natural products which come without any chemicals. One such natural product, which you could use to improve your hair’s appearance, texture and growth is ‘coconut milk’. You must have heard about the extensive use of coconut milk in food preparation, but besides this, coconut milk is an excellent hair-care product too. Are you tired of spending a lot of money on different hair conditioners and hair treatments, then you must surely try this natural conditioner. Coconut milk is a rich source of fat, which makes the hair soft, fights rough hair and deeply conditions it. Fat-soluble vitamin, vitamin E, present in it brings shine and softness to your hair. It makes your hair soft and supple and adds shine to it. Nutrients present in coconut milk, like magnesium, copper and selenium promote hair growth by maintaining the integrity of cell membranes present in the hair follicles. Protein present in coconut milk strengthens your hair and encourages healthy hair development. It prevents hair loss and adds volume to the hair, which improve the overall appearance of your hair. Dry scalp may lead to dull and rough hair and in such cases, hair fall is common. Nutrients and healthy compounds present in coconut milk increase the blood circulation to hair follicles via scalp. Blood delivers oxygen, vitamins and minerals to the hair and thus, stimulates hair growth and reduces hair fall. Applying coconut milk to the scalp will moisten and hydrate the scalp and may further help you in getting rid of dry scalp. Bacterial and fungal infection of the scalp may cause redness, itching and irritation of the scalp. It further affects the hair growth and may even lead to hair fall and negatively affect the texture and volume of your hair. Coconut milk possesses antimicrobial and anti-fungal activities. 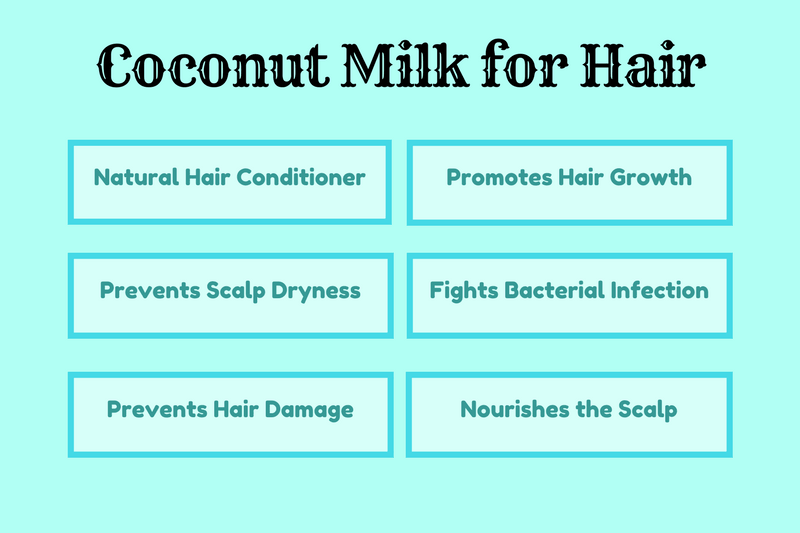 Application of coconut milk may help in clearing the bacterial and fungal infection of the scalp. It strengthens the roots of the hair, nourishes them and improves the circulation of oxygen and nutrient-rich blood towards the scalp. As the health of the scalp improves, hair fall, and other hair problems automatically disappear. Massaging your scalp and hair with coconut milk for 5 to 10 minutes help in restoring the dry and damaged hair. Coconut milk possesses excellent moisturizing properties, which helps in healing brittle hair and split ends. Thus, coconut milk can be used as an excellent tonic for dry scalp and damaged hair. Apply warm coconut milk on your hair and wash it after 30-45 minutes. You can repeat this twice a week. This acts as a natural hair conditioner and softener. Note: The positive effects of coconut milk on hair health will appear only after you apply coconut milk alone or in combination with other ingredients regularly. Irregular application of coconut milk will not help.